Posted By:Unknown | At:6:16 AM Be the first to comment! 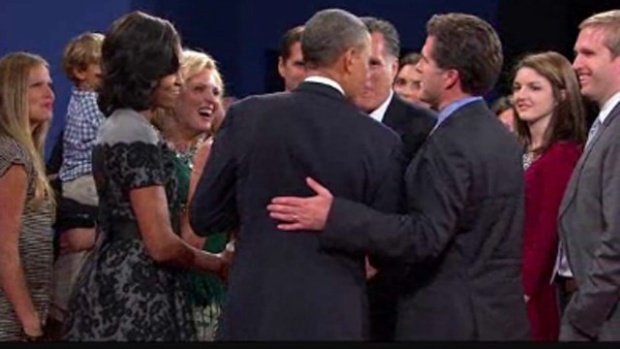 Obama and Tagg Romney were seen speaking on the stage after Monday's final presidential debate, held at Lynn University in Boca Raton, Florida. Two Obama aides said the conversation included an apology for the remark, made last week during a radio interview. Asked in that interview what it's like "to hear the President of the United States call your dad a liar," Tagg Romney joked about his fantasy response. "Jump out of your seat and you want to rush down to the debate stage and take a swing at him," he said. "But you know you can't do that because, well, first because there's a lot of Secret Service between you and him, but also because that's the nature of the process. You know they're going to try to do anything they can do to make my dad into something he's not." "We signed up for it, we've got to kind of sit there and take our punches, and send them the other way," he continued. One of Tagg Romney's brothers, Josh, downplayed the comments in an interview on ABC's "The View." "That brother has slugged me a couple of times," Josh Romney said. "I'm sure President Obama has nothing to worry about." Asked about the original comments on Thursday, Romney campaign spokeswoman Amanda Henneberg said Tagg Romney was "joking about how frustrating this process can be for family."